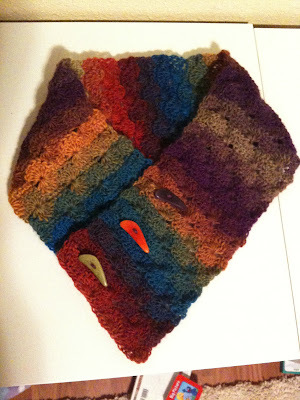 Twist & Loop: Yet Another Neckwarmer. Love It! Friends uniting to share ideas, pictures and advice about knitting and crocheting (and more)! Yet Another Neckwarmer. Love It! Love this pattern. Love this yarn. Love these buttons. Love it, love it, love it! If you haven't signed up for access to Ravelry.com yet you must!!! I found the pattern through that site but here is a link to it on the owner's blog. It's called the Catherine Wheel Scarf (neck warmers are just short scarves), I omitted the border. The buttons are made from nutshells. I believe I posted close-up shots in a previous post. I have been crocheting on and off for years. A friend’s mom taught me to crochet a bit in grade school over 25 years ago, but I hadn’t done anything with it until a few years ago when I re-taught myself using a simple book. I have crocheted baby blankets for my children and completed a handful of other small projects. I love all things crafty but I don’t do near as much as I used to now that I have three children under the age of 6. Crocheting is the perfect craft for my life right now, relax in my recliner after the kids go to bed and stitch up some great things for them to wear, use, and play with! I'm a total crochet novice, having picked up the hobby in February of 2009. I am learning by surfing the internet, watching videos on YouTube, and playing around with things that are way too hard for a beginner! It's a joy for me to be doing something that appeals so much to both my creativity, and to my logical and mathematical side. I also enjoy golf, yoga, playing music (flute, violin, hammered dulcimer) and spending time with my husband and our four kids.